I was just asked today what the customs are in Italy regarding mancie (tips) and it inspired this blog post. 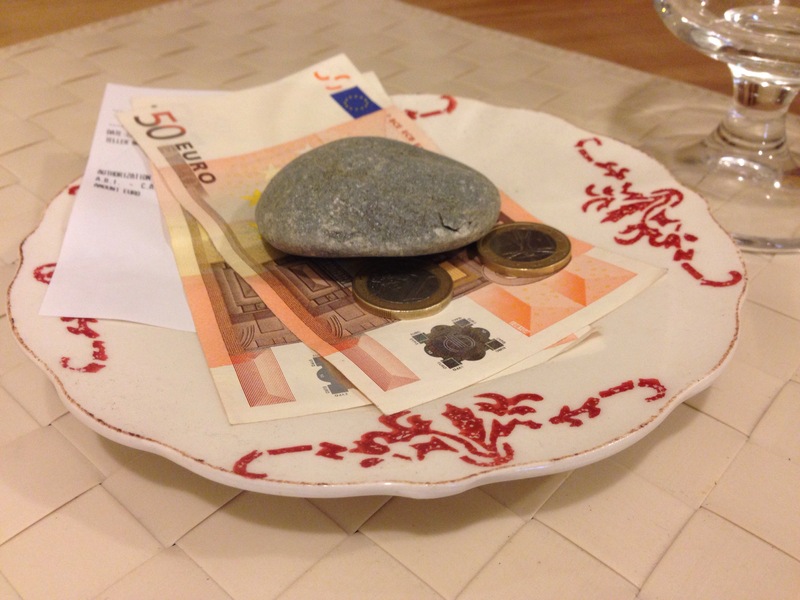 So, here I am to give you a crash course on tipping in Italy. Here’s the deal: We don’t tip in Italy. Wait, I take that back. We tip only if we’ve had what we consider excellent service. In that case, we round the bill (unlike other areas of the world, it’s not based on a percentage). For example, if your bill comes to €56 you could round to €60, or if it’s €89 you could round to €100. It’s very subjective and based on your level of satisfaction (and generosity). Italians working in the service industry in top travel destinations (think: Rome, Venice, Florence, Cinque Terre, Amalfi, etc.) have become quite spoiled by international travelers (that are so accustomed to leaving tips at home that they leave them here, too). People in the service industry here love these international tippers, but tipping is by no means obligatory. A pet peeve of mine is when a waiter specifies to diners at the end of their meal that servizio (a charge for “service,” which is oftentimes itemized on the bill) has not been included. This is a roundabout (and cheeky) way to insinuate that a tip should be left. Mind you, they would never dare say this to an Italian. Why aren’t tips customary in Italy? The explanation is simple. Wages are dignitoso (decent) so those working in the service industry can make a living without needing tips to round out their income. It’s a cover charge. It’s supposed to cover the costs involved with you sitting at a table (clean table linens, flatware, etc.). It’s a flat fee (for example, €2 per person) no matter whether you order all of the courses or just one. It’s different from “servizio” which is a charge for service. Not every restaurant in Italy will charge “coperto” but most will. Menus are required to be posted outside of the establishment and the price for the cover charge will be written there (if it’s not written on the menu, they can’t charge it).